Do you plan an autumn holiday? Would you like to make a family trip with relatives? Or would like you to travel to the countryside for a few days? 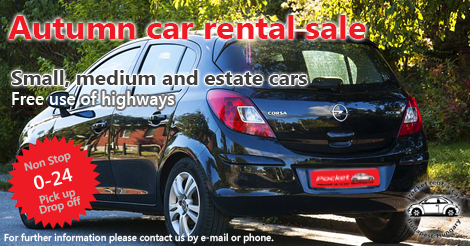 Rent a car now at more favorable price! *To take our sale please like our Facebook page! The promotion is valid if you make a reservation for a period of between 1 September 2016 and 31 October 2016. ← How to drive in strong wind, heavy rain?